Do you need a General Practitioner or Doctor’s Note? We provide a free General Practitioner note for work sample that suits your need! Download this doctor's note for work template now! If you are in a situation the doctor note focuses mostly on notes made by your General Practitioner or physician that will leverage the gravity of the note towards your HR department. It presents a brief statement from the GP where he clarifies that you are under his or her care. If this doctors note is not meant for you, but for example for your child, then you can use this doctor not so your child can take a leave from school. It’s important you are citing the doctor’s appointment, officially issued by the doctor, the note will state that the child would be having an appointment with him. This Doctor’s note is suitable for employees of all levels, even for those who hold higher positions in renowned companies. Especially those can suddenly fall ill. If an injury or illness is sudden, an employee may have little time left to explain to his superiors or HR department why he or she is not at work. If a person is missing out on work or daily duty, this can sometimes lead to demotion or loss of a career. A Doctor’s Note from a local Medical doctor will ensure you keep your job and position at the company once you recover from your illness or injury. 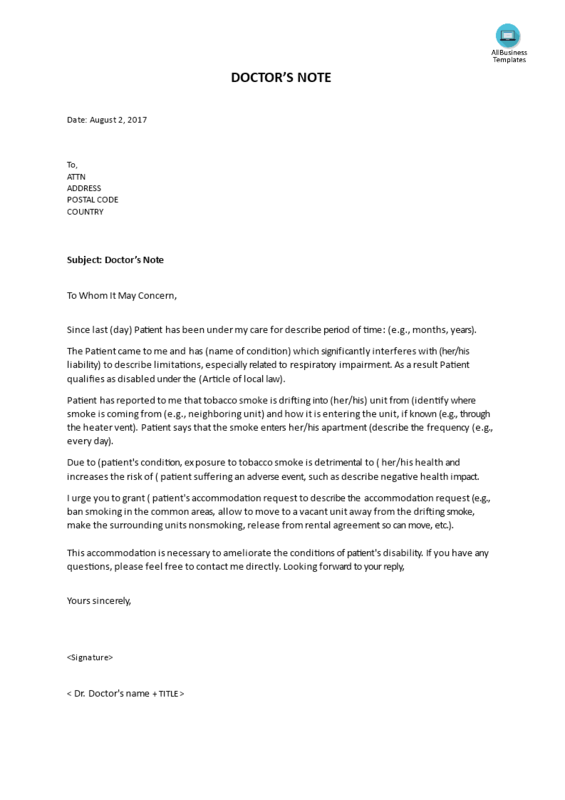 We support you by providing this Doctor’s Note template and you will see you will save time and effort. Download this free doctor’s note template now! For more? Just search on our website and have instant access to thousands of free and premium legal templates, business documents, business forms, business letters, reports, business plans, resume templates.